Extra-cost add-ons rarely make a vehicle more appealing, but $595 for a lick of Soul Red paint on the 2019 Mazda 6 is the exception. The 2019 Mazda 6 is a breakout among mid-sizers that can lack flair and fun. Any light is right for the 2019 Mazda 6 sedan, it’s a stunner. The Mazda 6 is a rare sight on the streets, but also unmistakable. Base sedans get 17-inch wheels that fill up its arches, but it’s not far to get dressy 19s that look great. The Soul Red paint swatch is a small upcharge and worth the price, we say. The sedan’s shape still looks windswept and organic, a flowing exercise of simplicity that other automakers just can’t match. It looks that good. Inside, the interior can be dark but a low dash helps bring in more natural light. The standard 8.0-inch touchscreen feels like an afterthought bolted to the top and paired to a painful control knob. Some trims wear their materials better, but top trims don’t feel authentically luxurious—just a half-step behind. The 2019 Mazda 6 nails all the little performance things to make a big difference. Mazda may well make a washing machine entertaining to drive so we won’t call the 2019 Mazda 6 just another mid-size appliance. The base engine on Sport and Touring models is a 2.5-liter inline-4 that makes 187 hp and 186 pound-feet of torque. Its only partner is a 6-speed automatic transmission that dims the engine’s performance a little—the manual kept the engine closer to a boil and we liked it but clearly no one else did. Grand Touring and higher trims get a 2.5-liter turbo-4 that doles out 250 hp on premium unleaded or 227 hp on everything else. It’s strong, and a Sport button makes the throttle and steering that much more eager. The base engine can shut down two of its cylinders when they’re not needed to cruise and the EPA rates it at 35 mpg on the highway. Efficiency isn’t the Mazda 6’s gift, handling is. The sedan’s sharp steering and electronic systems twist the 6 neatly around corners and bends. The steering isn’t especially fast—it’s relaxed on the interstate and tracks down the middle well—but its progressive rack dials in more steering as the speed increases in a very comfortable and quick way. Take one to the nearest roundabout, or circular on- or off-ramp, and speed up. We’ll wait here. Back? The 6 also had another trick for you while you were spinning around on-ramps. The sedan nearly imperceptibly stabs at the brakes and throttle to adjust the weight in the 6 to corner better. It’s a neat trick that happens in the background and we like it. The small demerit: the Mazda 6 is a little noisier inside than most of its competitors. Good space for four adults and a smart interior make the Mazda 6 a good choice among mid-sizers. By the numbers: The 6 spans 191.5 inches from bumper to bumper, 111.4 inches between the wheels. Rear passengers get 38.7 inches of leg room that seems more generous than it is—tall front-seat riders can eat into available space. The comfortable seats are shod in cloth, synthetic leather, real leather, or soft leather—a comparative melange of materials for a mid-sizer. We like the seats, but don’t love them. 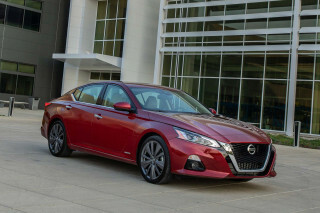 Compared to others from Nissan, the Mazda 6’s lack support. Rear seat passengers get their own USB chargers in Touring trims and higher. The trunk swallows 14.7 cubic feet of cargo, down fractionally against Mazda and Toyota. The 60/40-split folding rear seats offer some relief, provided you didn’t go to Home Depot with a full boat already. The top trims scatter soft nappa leather hides, suede-like door panels, and wood trim throughout the cabin. It’s top-notch stuff but feels a little thin. 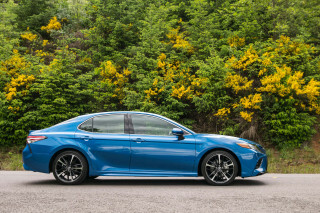 We’d stick closer to the Touring trim level that uses synthetic leather, and costs less. The 2019 Mazda 6 has earned glowing grades from federal and independent testers. Even without full crash-safety data, the 2019 Mazda 6 does well on our scoresheet. Aside from good outward vision, the Mazda 6 this year makes standard a suite of active safety features that include automatic emergency braking, active lane control, blind-spot monitors, and adaptive cruise control. A surround-view camera is available on top trims. 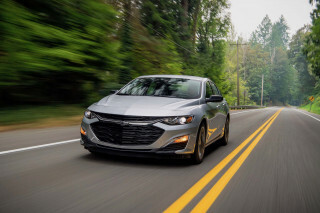 The IIHS tested the automatic emergency braking system last year and gave it a top “Superior” rating and said the system avoided a 12-mph forward crash altogether and mitigated a 25-mph forward crash by 24 mph. Every sedan is well-equipped, but the mid-level 2019 Mazda 6 is where we find the most satisfaction. Sedan shoppers are spoiled for choice: the 2019 Mazda 6 fills its cabin with excellent amenities on most trim levels and doesn’t ask too much in return. The Mazda 6 is available in five trim levels: Sport, Touring, Grand Touring, Grand Touring Reserve, and Signature. The Sport versions cost $24,720, including destination. Our sweet spot is the Mazda 6 Touring, which costs $27,320, and adds to Sport versions 19-inch wheels, smartphone compatibility, synthetic leather upholstery, heated front seats, a power-adjustable driver’s seat, two rear USB chargers, and keyless ignition. Three top-shelf paint options cost more on the Mazda 6—up to $595 for a sumptuous shade of red, and we’d click “Accept” on all three: red, white, or gray. Mazda charges at least $36,020 for a 2019 6 Signature but we’re not sold on its value. It offers a gunmetal gray grille, a surround-view camera system, head-up display, leather upholstery, 7.0-inch digital instrument display, navigation, beautiful open-pore wood inside, a heated steering wheel, and cooled front seats as well as an uprated turbo-4 engine. It rivals some luxury sedans in equipment for less money, but it’s a big jump from a Mazda 6 Touring—and it lacks the badges. A word on Mazda infotainment: it’s bulky and confusing. Apple CarPlay and Android Compatibility is standard this year and worth the money—even changing radio stations is a chore with Mazda’s in-house system. The 2019 Mazda 6 is efficient at hauling people around. Sedans are more efficient people-carriers than SUVs and the 2019 Mazda 6 is proof. Top trims get a turbo-4 that sink fuel economy to 23/31/26 mpg. A slow-selling manual version of the Mazda6 was scrapped for 2019. Among sedans, the Mazda6’s fuel economy is lower but still within earshot. 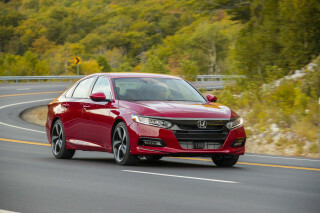 The Honda Accord rates 31 mpg combined in its most popular configuration, the Camry rates 32 mpg. 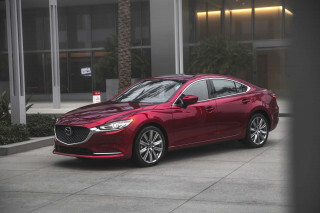 Among crossovers, which have effectively replaced many sedans in many garages, the Mazda6 meets or beats many of them.